Chickpeas, also called garbanzo beans, are the front and center of this creamy dip. This roasted garlic hummus is delicious with tortilla or pita chips. I usually make it in my magic bullet or blender, using dried chickpeas. You can also used canned chickpeas. If using dried beans, soak the chickpeas in water overnight. Boil chickpeas until soft. Let cool and add to the blender. Add all other ingredients to blender and blend until chunky. Taste test and add more salt or seasonings if necessary! 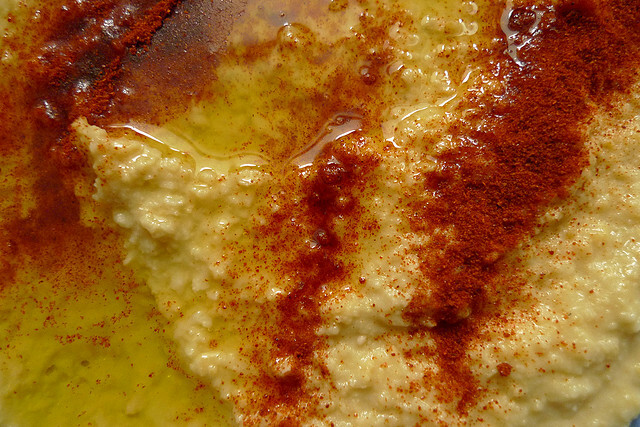 Dash with paprika and serve with a side of vegetable sticks or pita chips. Hummus is also a great addition to a sandwich or wrap!